To paraphrase John Cleese, “and now for something completely overdue.” A couple years ago I was sent a copy of Mark Roncace’s book, Raw Revelation: The Bible They Never Tell You About for review on this blog, with the understanding that it might take a little while for me to post a review since I was working on my dissertation and teaching quite a bit at that time. Needless to say, the delay was longer than planned, as shortly after receiving the book, I had to deal with a minor first-floor flood, two surgeries, and then a major house fire between the months of June and September in 2013—and those events only compounded the fact that I was teaching seven classes in the 2013–2014 academic year, writing hundreds of articles and providing content for multiple media outlets, and still writing the dissertation (oh yeah, that). All the while, Raw Revelation has sat on my desk (at least once I got a desk again after the fire), serving as a tormenting reminder that I had not yet honored my agreement to review the book. Partly as a result of that guilt, I have managed a paltry eight posts on this site since the house fire, including a post-fire life update and two article announcements. All that goes to say that it is now high time to give this book the review it deserves. One might initially think the cover is simply being hyperbolic with the “genocidal maniac” bit while the book would walk back from that position, but it is quickly evident that Roncace (who is a fine scholar recognized for his ability in the classroom) means exactly that and more. The book retains this aggressive, edgy, hyperbolic tone throughout, with Roncace pulling no punches as he aims to uncover what “they” have been unwilling to tell “you.” Unfortunately, this edgy approach is sure to turn off much of the target audience from the start. Many of those who might most benefit from such a book are unlikely to give it a read after being hit in the face with such claims right at the start, regardless of their merit. This approach ensures that the Christian never gets close enough to the Bible to see the difficulties and ambiguities and to wrestle through them. Thus most are blissfully unaware of two important things: 1) The Bible, when read closely, is not always unambiguous (something covered up, as Roncace points out, by apologetic literature and all sorts of helps that provide pat answers and easy ways around the difficulties), and 2) even those claiming sola scriptura are themselves beholden to centuries-old traditions external to the Bible that provide the hermeneutical keys through which they view and understand each passage (with sola scriptura itself a prime example of a tradition imposed on the Bible from the outside). Books that challenge Christians to see the difficulties in the Bible and test preconceptions and pat interpretations are badly needed. Nevertheless, I wound up frustrated by the book’s aggressive “shock and awe” approach and tendency to favor hyperbolic, literalistic readings in a piecemeal, proof-texting style and also had some reservations about the hermeneutical approach in the book as a whole. I will deal with the last of these first. Before I continue, I should note that 100% of the proceeds from the sale of Raw Revelation will be donated to international Christian charities. As my old teacher (full disclosure: also Roncace’s former classmate) Bill Lyons likes to say, we all tend to have our own selective hermeneutic, favoring some parts of the Bible (or whatever other authoritative text or tradition to which we look for guidance) over others, and Roncace argues that Christians have been especially guilty of “cooking the good book, boiling away the unsightly and unpalatable passages” that might otherwise disturb their comfortable, safe perspective. Instead, Roncace proposes that the Bible should be consumed raw, without the apparatus of later hermeneutic approaches or traditions that make it more easily digestible for a modern audience. To this end, Roncace presents six “courses” (chapters) of just such “raw revelation,” each focused on a particular theme: 1) The Bible, 2) God, 3) Jesus, 4) Doctrine, 5) Morality, and 6) Other Morsels. This choice to divide the book according to such categories is a bit ironic, as in so doing, Roncace adopts a systematic approach similar to what he critiques, essentially operating within the categories of his implied interlocutors. To some extent, this is just Roncace playing by the established rules of the game and meeting his interlocutors on their own terms, but I nevertheless could not escape the nagging sense that despite the book’s aggressive criticisms, Roncace remains entrapped within the very hermeneutical approaches he critiques. This impression is further strengthened by how Roncace adopts a strikingly literalist, biblicist approach throughout the book, albeit apparently operating by the principle that the most disturbing or unpleasant interpretation must be correct. I found Roncace’s efforts to play up some biblical difficulties hyperbolic or (paradoxically) plagued by a proof-texting approach familiar to anyone from a fundamentalist background. I don’t think Roncace is himself a biblical literalist or biblicist, but his efforts to play by those rules all too often undermine the larger point. I would have preferred to see the book set an example of better methods of interpretation and hermeneutics rather than simply flipping biblicist readings over and then objecting to their implications. It is also worth noting that Roncace seems to want to ignore all previous interpretations originating in a biblically-oriented community of faith in favor of an objective, “raw” reading not beholden to a given theological perspective. In many respects, this is admirable, but it also strikes me as naïve. First of all, Roncace himself comes from a specific traditional approach—he has merely traded a confessional Evangelical Christian perspective for that of modern critical biblical scholarship. That is, Roncace does not abandon all tradition but only overtly Christian tradition. In its place, he substitutes the hermeneutical traditions of modern critical biblical scholarship. This is not necessarily wrong—after all, I am myself a part of that guild of critical biblical scholars—but it does highlight an inherent difficulty with Roncace’s thesis of “raw revelation.” Texts are never consumed raw but rather depend on the perspective of the reader/audience—especially those that are foundational to a community like the Bible. The Bible has never stood alone and apart from a community of faith with specific traditions for how to understand its many ambiguities and difficulties. For example, in the first century, there was lots of debate over what it meant to “keep the Sabbath,” with different communities maintaining different traditions about the meaning of that passage. This is one of the fundamental insights of Postmodernism: texts are nothing without readers and communities. Put differently, it is impossible to read a text without a perspective. It is important, as Ricoeur emphasizes, to participate in an interpretive circle in which the reader allows the text to change him/her and reorient that initial perspective, and recognizing the importance of the reader does not mean any and all interpretations are of equal value or validity. But it does mean that one cannot, as Roncace suggests, simply shed all traditional baggage and consume the Bible “raw.” In this respect, Raw Revelation is as vulnerable to Christian Smith’s critique of biblicism as those Roncace targets. Secondly, although there is no question that many or all Christian traditions have “cooked the book” in some respect, they have typically made strenuous efforts to produce a meal that is faithful to the overarching narrative and principles they find in the Bible. So when a Catholic scholar argues that God is completely loving in spite of the ḥerem passages in which the Israelites are commanded to massacre every Canaanite, that scholar is not merely ignoring those passages—s/he is integrating those disturbing passages with the larger presentation of YHWH throughout the Bible and the Christian tradition. Roncace may, of course, argue that this approach is illegitimate and that those passages are impossible to reconcile with a loving God, but it begs the question simply to point to the ḥerem passages and scream, “See! The Bible clearly shows that God is not loving and good!” Raw Revelation asserts that such a conclusion is self-evident but in the process ignores the tremendous amount of ink spilled over the moral/ethical and theodicy implications of the ḥerem passages as Jewish and Christian thinkers have wrestled with these passages and their implications for theodicy over the past couple millennia. Thirdly, although he ostensibly wants to read the Bible “raw,” Roncace consistently interprets biblical passages from a modern perspective that would have been incoherent to the biblical authors and applies modern standards of morality and justice foreign to the biblical texts and the world from which they arose. It is a bit paradoxical that many of these moral standards historically derived in large measure from the biblical tradition, so I wonder to what degree such critiques involve sawing off the branch on which one sits. But Roncace’s preference for process theology helps account for that decision, since in that paradigm the inferior ideas of the past are superseded by those that grow out of them. Such an approach is, however, too vulnerable to chronological snobbery for my taste, and I wondered at many points whether simply throwing out both the baby and the bathwater wouldn’t be a better approach, particularly if one finds the book’s arguments in the chapter on God persuasive. God and the Problem of Death? That chapter on God (chapter 2) is in my view the most problematic in the book, in large part because it makes a weighty philosophical argument without defining its terms. The basic thesis of the chapter is that “The God we meet in the Word is not all good, holy, loving, and perfect” but “is portrayed as both—kind and loving, nasty and brutish” (p. 42). Naturally, since “they” have fed “us” only “a diluted and domesticated deity” (p. 42), the nasty and brutish stuff gets almost all the attention in this chapter as Roncace aims to show that the God of the Bible is not a nice person. This, “How dare God kill X person!” is common in modern discussions of theodicy, particularly among the so-called New Atheists, but it is utter nonsense. To see why, one only need consider the ultimate fate of those infants and children if God had not killed them at that time: they would have died later on. Roncace’s objections to the deaths of children and infants therefore presume that God is responsible only for premature deaths (“God mad. God kill baby.”[p. 64]), whereas a person dying in old age dies of natural causes rather than because God took that person’s life. But such a distinction is a fundamentally modern one; the Bible nowhere makes such a distinction, nor is there any indication that the biblical authors (who did not hold to a modern view of “natural causes” or “the laws of nature” as separate and distinct from God’s oversight) would have seen any difference in God’s involvement in someone dying in childhood versus dying at a ripe old age. In each case, God has taken that person’s life—as is God’s prerogative. In fact, from the Bible’s perspective, what makes murder a crime seems to be precisely that it involves a human being usurping divine authority over life and death. The fact that a person dies is not the problem since that person would have eventually died anyway. The violation is that the murderer hubristically laid claim to agency and authority that is rightfully God’s. Thus by definition, God cannot commit murder, as life and death fall under his authority; he grants life and takes it back again. Applying the principles of murder to God (i.e., “How dare God kill X!”) is a category mistake. If God takes the life of all who die, God is no more or less immoral for taking the life of a baby than for taking the life of anyone else. That is, if God is immoral for taking the life of a child, God is immoral for all deaths. Understanding this cuts the legs out from much of the second chapter, a large percentage of which relies on the principle that something that would be wrong for a human being is therefore immoral for God. The first chapter (“The Bible”) is mostly devoted to revealing tensions and contradictions in the Bible with the aim of demonstrating that the Bible is not a univocal document written down by God himself but rather a collection of traditions in discussion with one another. This is an important lesson, though I found some of Roncace’s passage choices—and his characterization of them—disappointing. For example, the contradiction regarding “Who Killed Goliath” (p. 35–36) is almost certainly the result of a simple scribal error in 2 Sam 21:19, turning, “killed the brother of Goliath the Gittite” (which is the reading of the parallel passage in 1 Chr 20:5) into “killed Goliath the Gittite.” This is an especially easy mistake, as the Hebrew for “brother of” differs from the direct-object marker by only one very similar letter, so אח (brother) easily becomes את (the direct object marker), producing a contradiction in the text. I think Roncace would have been better served to explain this more fully, both highlighting the process of transmission and how such errors came to exist in the text. Also, Roncace regularly refers to the Bible as “God’s word,” which I find odd given his attempt to remain true to the Bible itself. After all, the Gospel of John spends significant space arguing that the written scriptures are not in fact the Word of God; rather, John argues, the Word of God is the person of Christ manifest in the church. The written scriptures are merely witnesses to this Word (cf. John 5:39). Nevertheless, the basic conclusion that the Bible is not univocal and should not be boiled down to one homogenous mixture is a good and important point. The third chapter is fairly uneventful in my view, emphasizing that Jesus was a Jew, not a Christian, and that he was indeed a man of his own time. Roncace plays up aspects of Jesus that would not be popular today and suggests that Christians engage with the full picture. Again, there are a number of places where I could quibble with specific details (such as the out-of-date presentation of the Christological perspectives of the four Gospels), but overall, many of the basic points are worth engaging for most Christians. Many sacred cows are killed in the fourth chapter, and it may be the best of the book. Many Christians are bound to be surprised by the revelations that the doctrines of the Trinity, the omni-X of God, modern tithing directives, and many other doctrines are not directly found in the Bible but come from later traditions. Similarly, the concept of the Holy Spirit is less clear in the Bible than one might expect, and the concept of salvation familiar to most modern Christians is quite different from the presentation in the Bible (though Roncace does not represent Paul’s position as well as I would have liked). There are a few odd mistakes in the chapter, such as the bizarre idea that the tithe being “holy to the Lord” in Lev 27 “means the tithes are burned or poured out on the altar as a sacrifice. That is tantamount to collecting the tithe money and then lighting it on fire.” Far from being a “raw” reading of what the text actually says, Roncace here defaults to a modern misunderstanding of ancient Israelite sacrifice, which typically involved eating portions of the holy food in a common meal after offering it (=cooking it) on the altar. (This is a good example of how even this book does not present “raw revelation” but is itself beholden to specific traditional hermeneutical assumptions.) Nevertheless, this chapter is worth the read as it reminds us that “the Bible does not offer us clear, unambiguous answers to [many] doctrinal questions” (p. 157). Like the previous “course,” the fifth chapter focuses on key hobby-horses, this time mostly in the arenas of sexuality and common culture-war territory. Roncace focuses on the gaps in what the Bible prohibits or commands and encourages the reader to think more carefully about the perspectives from which the biblical writers are coming in order to better apply the principles to today. I don’t think some of the issues Roncace addresses are quite as open-ended as he suggests (note again, the hyperbolic tendency of the book), but the basic point of getting away from a biblicist approach and understand biblical principles is critically important, though somewhat at odds with the first parts of the book. Roncace seems to get simultaneously more and less traditional in these sections. It is difficult to disagree with his conclusion: “We are not loving, open, and honest when we cherry-pick certain verses to support our own personal agendas. 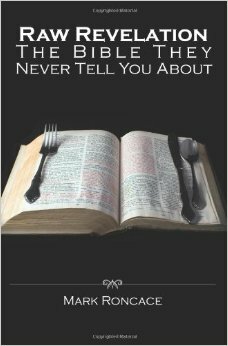 We shouldn’t make the Bible say what we want it to say; we shouldn’t put words in its mouth” (p. 191). The sixth “course” looks at external factors germane to understanding the Bible, underscoring the process of canonization, how texts were copied by hand, how errors and alterations were introduced by scribes, etc. This chapter is a useful primer and would have been better earlier in the book. This is a fundamentally destructive book; it aims to root out naïve, comfortable, and uncritical interpretations, forcing the reader to return to the Bible with fresh eyes, engaging and wrestling with the difficult portions of the Bible and the Christian tradition. This is admirable. Unfortunately, the book is reactive in that it is defined by the paradigms it opposes and deconstructive in that it is against something rather than for anything. In order to combat the tendency to select only the positive parts of the Bible, this book almost exclusively emphasizes the negative or difficult parts of the Bible, producing an equally (or perhaps even more) unbalanced meal. In consequence, the book has little constructive in the way of alternative approaches to offer Christians who have been disabused of their former naïveté, which is regrettable. We should hold God accountable. We should protest God’s attitude and conduct. We should be bold enough to tell God what we think. … Instead of offering God our praises, we should offer our appraisals. If you say God can do whatever he wants because he’s God, I say: No way! I am not interested in being a part of a religious tradition in which God can sanction the murder of tens of thousands of people and we don’t bat an eye.” (p. 80–82). This is simultaneously an admirable sentiment and highly problematic to any notion that such a God is worthy of worship or service. It also veers dangerously into the very territory Roncace cautions against elsewhere in the book, encouraging human beings to define what God should be, making God in their own images. If something in the Bible is distasteful about God, reject it! As with so much of this book, I find that Roncace’s cure paradoxically winds up in much the same territory as the disease he aims to treat. I argue that any God who is worshiped should be worthy of love and worship. The God presented in Raw Revelation is far from it; this is not the God who is the embodiment and definition of The Good. Instead, the God of Raw Revelation looks remarkably like the bumbling Demiurge of some forms of early Gnostic Christianity. And it is not clear why Roncace, who is clearly aware of the process of canonization and how that was itself dependent on extrabiblical tradition, reverences the Bible at all. Why should anyone regard such a repugnant book as revelation? Again, the premises and foundations are left unstated and undefended. This is, for what it’s worth, one of the key points at issue when John and Paul emphasize that the written Scriptures are insufficient. It is impossible for something to be written that provides a proper answer for every possible circumstance and every action, meaning what is truly important is the spirit of the law, understanding the principles underlying the scriptures and being able to extrapolate and apply these principles in each circumstance and time. The New Testament emphasizes that this capacity is granted by the Holy Spirit (or paraclete in John), which empowers a person to do just that; in any case, this means it is important to recognize that the Bible does not contain unambiguous answers to all the possible questions in life, something this book demonstrates quite well. Disclosure: I received a free copy of this book for review and am also an Amazon affiliate, meaning I get a small commission on any book purchased through an Amazon link from this blog. If you beieve that a book is the Christ you are still asleep. You should pray to be born from above and to come out from under the tree of good and evil (fear) and to stand only under the tree of life (LOVE). Bye yourself a copy of the 1611 King James Bible and read the preface. The ones who translated it say in the preface that some wording and versus are changed by them being forced to so by the “King” and the “Catholic Church” example: “If I be lifted up I will drag all men unto me” is the correct wording in this passage. You my friend are a part of the Christ, one and the same and if you could look upon your true Spirit you would go blind from the brightness of who You Are! My dear brother in Christ I only see Spirit when I look at any man in this world. We are created in the image of our Father who is Spirit. Spirit is perfect and cannot sin because in the spirit world there is no sin. If you see flesh and blood of Gods creation you are as a child and still asleep, but that is ok because all will awaken in his own order. Jesus loved being around a drunkard or harlot because he Only seen their Spirit which he new was perfect and did not judge their flesh man. He That has An Ear Hear. Great review! I’m sorry that it seems you often get strange, ignorant responses from the weirdos of the web. I found this helpful! I found this extremely astute and very helpful. Will try to give the book a read soon. Thank you!